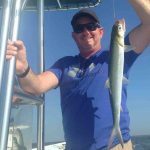 During the winter months Hilton Head Island offers some of the best inshore fishing anywhere in the United States and the shallow water sight fishing is world class to say the least. On a standard trip we would pole the flats to find huge schools of redfish, many schools numbering in the hundreds as they cruise through crystal clear water. 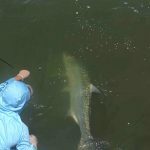 This gives us the opportunity to sight fish using artificial lures and flies…and the best part of the experience is that you get to see the fish take the bait before you set up for the fight. On the nearshore wrecks we will be fishing primarily for sheepshead. These guys will take over the wrecks this time of the year and put up a great fight on light tackle which offers good steady action for the whole family. Moreover, they are exceptionally good eating so you may want to take a few back for a fish fry! Spring has a lot to offer to those of us who enjoy the outdoors. In the fishing world, as the days become longer and the water temperature starts to heat up so does the fishing. When the inshore redfish start to break out of their schooling patterns they will spread out and start feeding heavily as the estuary becomes abundant with small bait fish, shrimp and crabs. 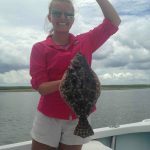 Mixed in with the reds we will also be catching good numbers of speckled sea trout, flounder and small sharks. In the Port Royal Sound the cobia should be migrating in as they prepare to spawn. 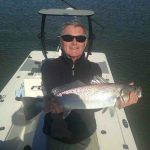 This offers us a great chance to get out and sight fish for these bruisers (many weighing between 25 and 45 pounds) using light spinning tackle and fly rods. 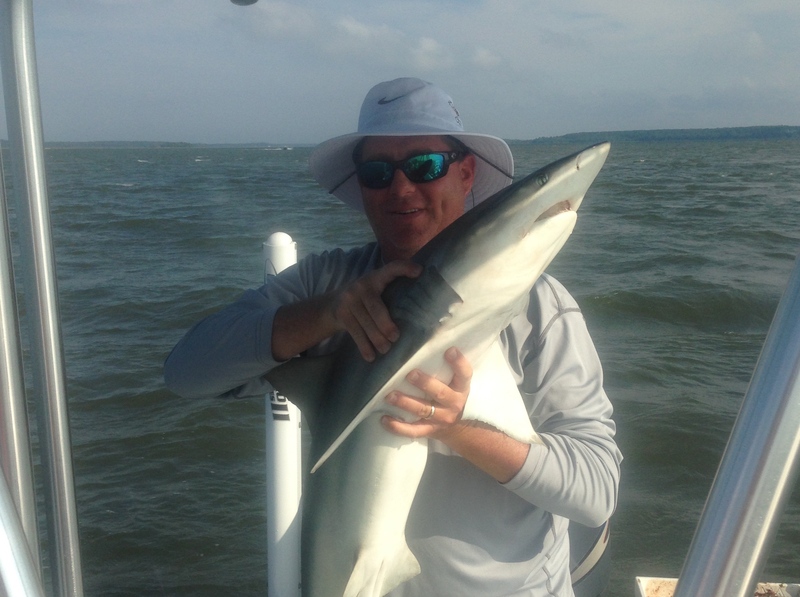 Out in the sound we will also be targeting fish such as spanish mackerel, black sea bass and various sharks. 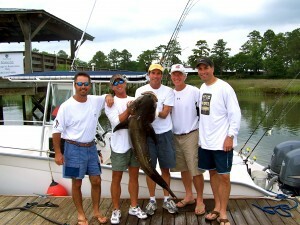 The summer action around Hilton Head can be summed up in two words “mixed bag”! This is an excellent time go fishing because we have so many options. 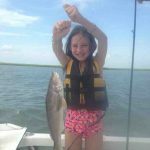 On the inshore waters we will be targeting redfish, flounder, trout, black drum, mackerel and various sharks using a combination of lures and live bait tactics. 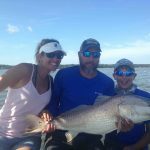 Given the right conditions we may also get up on the shallow short grass flats in search of tailing redfish…if you like to “hunt for fish” this is the ultimate experience! 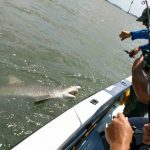 Out in the sound we will be targeting the mighty tarpon, many of which go over 100 pound and put on a remarkable ariel show. Mixed in with the tarpon will be good numbers of sharks such as blacktips, duskies and bonnet heads. 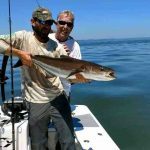 On top of that we will have some great action off of the beach and on the nearshore wrecks for species such as cobia, jacks, mackerel, whiting and sea bass. What more can I say, summer fishing has something for everyone! 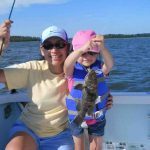 As far as I am concerned the fall is my favorite time of the year to fish simply because the cool crisp temperatures make a day on the water every bit as enjoyable as the fishing. 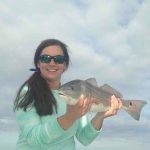 The shorter days will really get the inshore redfish, trout, and flounder feeding as they prepare for the winter months. 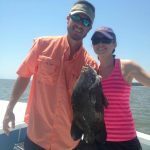 We will spend most of our time pitching lures, flies and live baits around the oyster bars, creeks and mud flats to catch these fish as they gorge themselves on small bait fish and shrimp. Speaking of shrimp, this is the time of year when we can get out to catch some nice sized shrimp for dinner. Generally we can spend an hour or so to catch shrimp on an inshore trip, so why not take home a few fish and shrimp? Out in the sound the bull redfish will be pushing in strong. 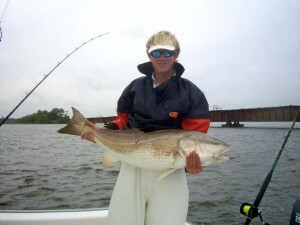 Bull reds are the same as the inshore redfish only bigger, a lot bigger! Many of these bruisers will be in the 25-40 pound range and fight like a freight train. 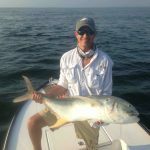 In addition, we also have some great fishing on the nearshore wrecks for the bull reds, weakfish, sea bass and blues so let’s get out and catch em up! This is only a brief overview of what you can expect to catch during the year. 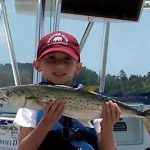 For more information about what’s biting check out my fishing blog or facebook page and to CLICK HERE to Customize Your Own Guided Fishing Trip -or- contact me via phone or e-mail. Tarpon – (Megalops atlanticus), AKA the Silver King. Tarpon are one of the largest and most powerful species of fish found in our inshore and nearshore waters. Tarpon are highly migratory, usually following the bait runs up and down the Atlantic seaboard. They are known for blistering runs and powerful jumps when hooked. These fish generally migrate through our area during mid summer through early fall. For More information click here! 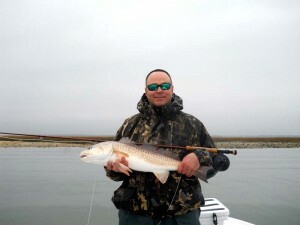 Bull Redfish – (Sciaenops ocellatus), AKA red drum or reds. In looking at the life cycle of redfish; they grow up in protected backwaters and estuaries until about 4-5 years of age. From there they move out to deeper waters and join up with the breeding population. These adult fish would be considered “bull reds”. Big bulls can weigh anywhere from 15-50 plus pounds and we generally catch them during the fall months. For More information click here! T riple Tail – (Lobotes surinamensis), Atlantic triple tails are found throughout the Atlantic from Massachusetts to Argentina. We usually find them underneath floating debris while running through the sound and across the beach in anywhere from 10-60 feet of water. For the most part we will usually start catching triple tails by mid-spring and throughout the summer months using light spinning tackle and fly rods. Sheepshead – (Calamus penna) AKA convicts. 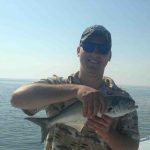 These fish are found throughout the Eastern Seaboard and Gulf of Mexico around hard structure on both inshore and offshore waters. Sheepshead primarily feed on crustations such as crabs and barnacles which is why they have such hard mouths and teeth. 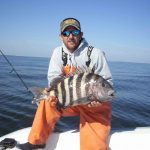 We catch sheepshead throughout the year but the best fishing occurs during the winter months while wreck fishing. For More information click here! Black Sea Bass – (Centropristis striata), AKA Black Bass. These fish are exclusively a marine fish and are actually not a “bass” but rather a type of grouper. These fish are generally found in more temperate regions especially around offshore live bottom areas and artificial wreck sites. 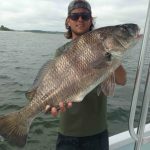 We commonly catch black bass throughout the year on both light spinning tackle and fly fishing gear. For More information click here!